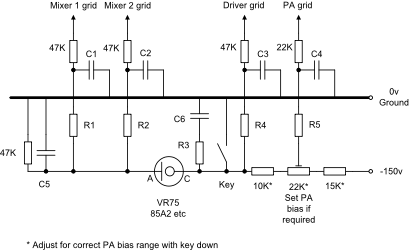 The circuit to the right shows a very basic transmitter control using grid blocked keying for a typical dual conversion SSB transmitter. In the key up condition the transmitted in prevented from generating any output. Note that all other stages must be capable of running without damage or over-heating in this condition. When the key is pressed the negative bias is removed/reduced and the transmitter will generate its normal output power. If the application uses one or two or three mixers in the transmit path then all of them must be keyed to prevent any by-products being heard in the associated receiver. The voltage drop across the VR tube means that significantly less negative bias is available for controlling the mixers. NB VFO keying should not be required if the mixers are completely cut off. This technique may also be used in older style VFO / multiplier / PA non-mixer designs. Envelope shaping to prevent key clicks, chirp etc is achieved using time constants R1/C1, R2/C2, R4/C3 and R5/C4 which should be selected for each individual application. Typical rise and fall times are around 2ms - 6mS depending on the required CW speed. 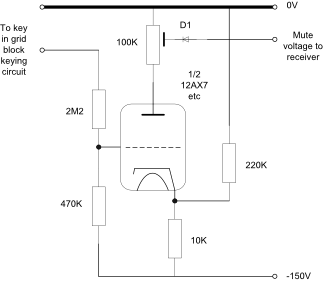 The following circuit generates a negative voltage used to mute the receiver when transmitting. Modifications to the AGC system will be required to enable the receive AGC time constant to be isolated from the muting facility. The values shown may need to be adjusted for each users particular circuit and operating voltages. With the key up the triode should be cut-of and the voltage drop across the anode resistor zero. With the key down the valve should conduct and the resulting anode current will provide a negative voltage to mute the receiver via the isolating diode. The selected valve must have a sufficiently high heater cathode break-down voltage. A high voltage MOS n-channel FET could be used instead of the valve but check the maximum gate source voltage and adjust the potential divider accordingly. The following circuit is a T/R switch that can be used with low and medium power PAs to isolate the receiver during transmit periods. The PA must be completely cut-off on receive to ensure that any noise due to its anode current is fully suppressed. The above example break-in circuit achieves this requirement. Cathode followers are not unconditionally stable so if any tendency to oscillation is noted then place a 22 ohm resistor in series with the feed to (and close to) the control grid. The cathode resistor may need to be adjusted to get the correct bias conditions for the particular valve in use. If the final value is significantly less than 470 ohms then a small RF choke may be required in series with the resistor to minimise losses of signal level. This T-R switch has one slight disadvantage in that the Pi tank circuit provides a step-up in the received signal levels which can cause overload problems in the associated receiver - this can be corrected by using the receiver aerial attenuator switch or a capacitive attenuator feeding the TR switch control grid. The circuit should be constructed adjacent to but outside of the screened PA compartment and all power lines well decoupled. NOTE: This circuit is intended for use with a valve receiver which is more tolerant of RF voltages at the aerial socket than its solid-state equivalent. If you want to use this circuit with a solid state receiver then do check the RF output level to the receiver during transmission before connecting it to the receiver. If it is excessive then it may be necessary to apply a significant negative bias to the lower end of the control grid resistor during transmit periods to ensure that the T/R valve is fully cut-off. 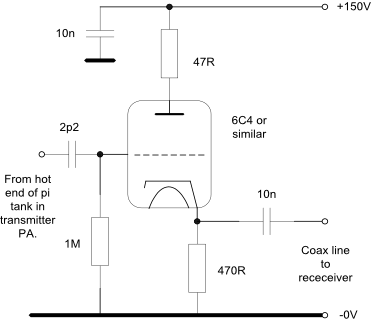 The receiver mute circuit could supply this negative potential. The 2p2 capacitor may be constructed from two 4p7 or three 6p8 capacitors in series to ensure a sufficiently high working voltage. Connect one end of this capacitor to the hot end of the pi-tank circuit and NOT directly to the PA anodes. If you are concerned about possible heater-cathode breakdown or signal losses then insert RF chokes in series with both heater connections. This circuit is in use in a modified Heathkit SB-401 with a 100W HF PA which is run from a 700V DC supply. Extreme care is required when working on this type of equipment with the high voltages involved. Make sure that it is switched off, disconnected from the mains supply and the internal supplies are fully discharged before working on the equipment.